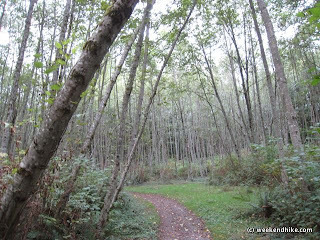 This six and a half mile hike is a great "best of Cougar Mountain" hike. 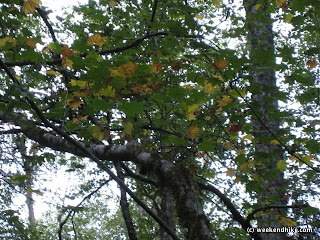 The leaves are just about to turn colors, so for the next couple weeks it should be a colorful hike. After getting to Shy Bear Pass, turn left on the Shy Bear Pass trail. 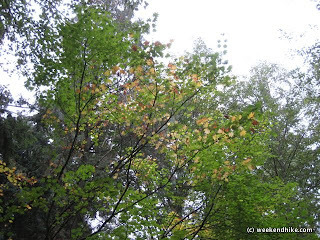 Some of the trees where already starting to turn into yellows and oranges. 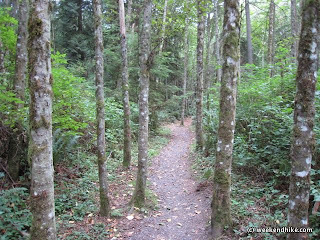 One really cool spot along this hike is the opening on the Freds Railroad trail with these trees that sway with the wind. Before the Claypit road, turn left on the short by very well maintained Bypass trail. After 0.2 miles, the Bypass Trail ends at the Cave Hole Trail. Keep Left here to continue toward the Cave Hole. Ok, I have to admit -- I am not sure I ever saw the Cave Hole on this trail. I saw one pit off to the right, not sure if it was "the hole" or not. 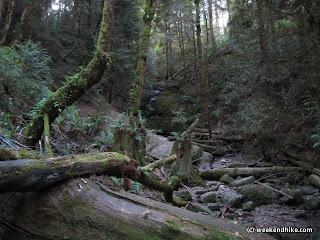 Luckily the leaves were starting to turn on trees on this trail, plus there were a number of frogs crooking as I made my way to the next left turn on the Coal Creek Falls Trail. More very happy and loud small frogs along the Coal Creek Trail. The Coal Creek falls are very dry right now, but usually there is a nice refreshing stream of water running over the huge boulders. 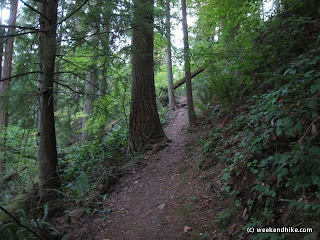 After crossing over Coal Creek, continue on the trail up to the Quarry trail. 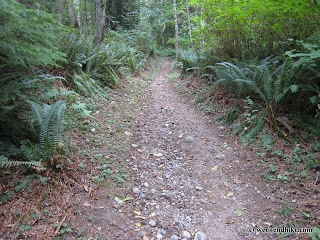 The Quarry trail is fairly rocky and a bit steep in parts. 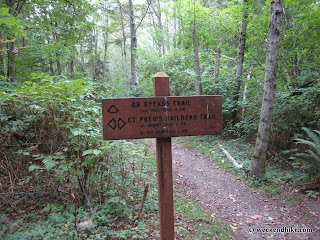 Its a great final workout before you start back down the mountain using Freds Railroad, Shy Bear and Wilderness Creek Trail to the parking lot. 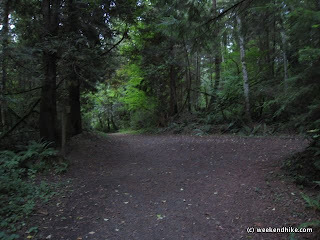 Great hike for a well rounded tour of Cougar Mountain from the Southeast side of the park. The are plenty of signs with good directions, but you may want to bring a map as it can be a bit confusing at a couple intersections. Trail - Lollipop out and back, well packed dirt trails. Well marked and maintained.